We check over 450 stores daily and we last saw this product for $20 at AKIRA. Demand more than 'hey'. 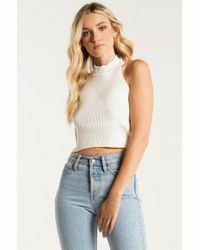 The Hey There Open Back Sweater Crop is a class act in the front with a high halter neckline, and welcome to my wild side with the open back that's fastened by crisscross string. Simple but effective. 50% viscose 28% PBT 22% nylon. Dry clean only. 16" shoulder to hem. She is wearing a size Small.